I’m using this review to fill my Birthday! square, as Becky Albertalli’s birthday is November 17th. I loved Simon Vs. the Homosapien Agenda and The Upside of Unrequited, so of course I wanted to read Albertalli’s newest book. 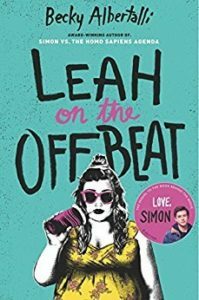 Leah on the Offbeat is more of a direct sequel to Simon, as Upside focused on different characters on the very outskirts of the universe. Here, Simon’s friend Leah deals with high school drama of her own. Leah knows who she is; she’s fat, she’s a Slytherin, she’s a drummer. She’s a little self conscious about not being as rich as her classmates, as she was raised by her single mother. What she hasn’t told any of her friends, including Simon, is that she is bisexual. It changes her feelings towards Abby in the previous book. Where it seemed that she didn’t like the new girl because of a crush on mutual friend Nick, Leah had actually been struggling with an attraction to Abby. It turns out that those feelings haven’t gone away. What’s worse is that it makes every interaction with Abby awkward. Not that it matters if Leah likes Abby because Abby is dating Nick and Abby is straight. But Abby and Leah are going to the same college, and Abby wants Leah to go with her for a campus visit. Then she breaks up with Nick because she doesn’t want a long distance relationship. Also, it turns out that Abby might not be as straight as she thought she was. I love the characters in Albertalli’s books. In general, teenagers make me nervous and frightened, but these kids are so sweet and funny. I want to help them with their homework and give them hugs and bake them cookies and help them with their complicated love lives (Although, at least they have love lives…maybe they can help with mine!) Leah on the Offbeat is another excellent book and I’m excited to read more from Albertalli. You can visit my review in its natural setting at my blog here. Now I’ve got three books to add to my TBR pile. Thanks for the review.